Operators of power turbines around the world rely on us to maximise the performance and reliability of their equipment. Our expertise supports power turbines used in the global power generation, oil & gas and marine propulsion industries. Our capability extends across SK15, SK30 and GT22-40 and we are the OEM for KSS power turbines. In addition, we provide comprehensive maintenance support for Siemens RT48/S, RT56, RT61 and RT62 power turbines under contract with the OEM. From component repair to major overhaul and final balance to field support, we deliver a comprehensive scope of service for your power turbines. Our track record speaks for itself. We have been in business supporting rotating equipment for nearly three decades. Our depth of experience is unsurpassed in the industry. We know your product inside out. And we have the knowledge and technical capability to lower repair costs and minimise power turbine maintenance lead times. As an RWG customer, we focus on your specific needs. Our dedicated maintenance facilities in the UK and US are equipped with specialist power turbine tooling and the latest repair technologies. We design the optimum maintenance regime for your equipment, combining annual inspections with 25,000 hour detailed inspections and 100,000 hour major overhauls. Within our in-house balancing facilities, we’ll demonstrate the integrity of your power turbine before it is returned to service. Our specialist component repair technologies bring you lower repair costs and improved turntimes. And when it comes to field support, with regional service centres and highly skilled teams we are there for you wherever and whenever you need us. 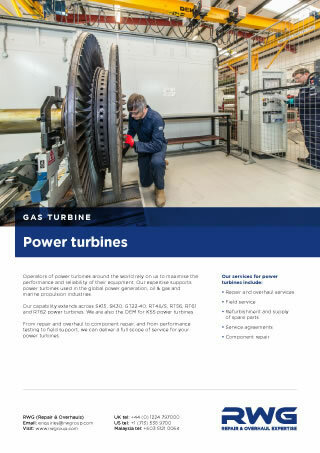 Get in touch with us to discuss your power turbine service requirements.